After months of research, development and testing, a light European Chocolate flavoring won the right to bear the SLIM Shots name. Ideavillage Products Corp, the U.S. distributor of SLIM Shots, announced this week that the line extension requested by customers and Retail channels alike will ship to retail outlets as early as February 15th. We've got all the right elements in play--41 million of them. After months of research, development and testing, a light European Chocolate flavoring won the right to bear the SLIM Shots name. Ideavillage Products Corp, the U.S. distributor of SLIM Shots, announced this week that the line extension requested by customers and Retail channels alike will ship to retail outlets as early as February 15th. Supporting the European weight management Brand's two flavors, vanilla and chocolate, is a $41 million advertising budget that includes a media investment exceeding $20 million in the first quarter alone. The new flavor and advertising campaign is expected to set the stage for a banner year in the Brand's consumer sales. The media campaign, which began on December 29, is aggressive; designed to reach 90% of Women 18 to 49-years old and deliver 630 million impressions. According to company officials, the effort includes more than 15,000 thirty second television commercials across 32 cable networks, 975 thirty second television commercials airing across 3 Hispanic networks, 3 national FSIs, and small space ads in 14 women's interest, beauty, and entertainment magazines. 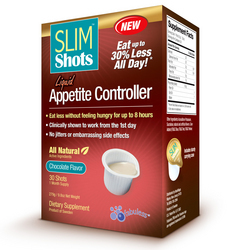 Launched in March, 2008, SLIM Shots vanilla flavor distinguished itself in just 3 short quarters - becoming the #1 selling SKU in the liquid diet aid segment at CVS and Duane Reade, the #2 selling SKU (dollars) in the liquid diet aid segment at Walgreens, and the #5 selling SKU (dollars) compared to diet pills at CVS, Duane Reade and Walgreens. At drug channels, SLIM Shots consistently out performed Alli's 60ct. in units sold and over the past 12 weeks is outselling the #1 SlimQuick SKU in dollars. Ron Boger, Ideavillage executive vice president of SLIM Shots, commented on the achievements, "We have to keep reminding ourselves that SLIM Shots has been on the market less than a year." While early accomplishments prove the Brand is a viable contender in the diet aid space, the company's $41 million advertising commitment positions it as a major player in the segment. "I'm confident that 2009 will take the Brand to the next level," said Boger, adding, "We've got all the right elements in play--41 million of them." Like vanilla flavored SLIM Shots, the new chocolate line is available in 14 and 30 count boxes and carries a suggested retail price $19.99 and $39.99 respectively. Early adopters of the new chocolate line include Walgreens and CVS. The vanilla flavor also comes in a 21 count box at a suggested retail price of $29.99. SLIM Shots is available at CVS, Walgreens, Rite Aid, Duane Reade, GNC, Vitamin Shoppe, WalMart and other fine retail outlets. For more information on SLIM Shots, visit http://www.slimshots.com.